A service of thanksgiving for the life of Mary Wilson was held on 26 November. Gladys Mary Wilson, Baroness Wilson of Rievaulx, was an English poet and wife of the former Labour Prime Minister Harold Wilson. Baron Wilson of Rievaulx, KG, OBE, PC, FRS, FSS was an Economics Fellow at Univ from 1938 to 1945. 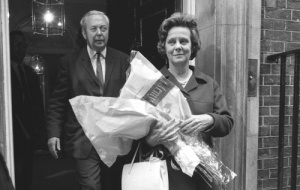 Baroness Wilson died on 6 June 2018, aged 102, the only spouse of any UK Prime Minister to have died a centenarian. The service, which took place at the Guild Church of St. Martin-within-Ludgate, a charming Wren church near St Paul’s Cathedral, was intimate, with music provided by a choir comprised of family and friends. Dr Robin Darwall-Smith (1982, Classics), College Archivist, attended the memorial service as the College’s representative on behalf of the Master, and sang in the choir. He commented that it came across during the service just how much Mary Wilson was liked and esteemed. Robin Butler (1957, Classics), Lord Butler of Brockwell, former Master of the College (1998-2008), and Lady Butler also attended the ceremony. Two former Prime Ministers, Gordon Brown and Sir John Major, both read lessons, with Margaret Beckett giving a tribute. Richard Harries, Baron Harries of Pentregarth, FRSL, former Bishop of Oxford, gave the sermon. We extend our deepest sympathies to Mary’s family in particular her two sons Robin and Giles.